In order to effectively combat climate change, rapid transition to renewable energy is essential and new economic opportunities are rapidly emerging. The recent progress towards renewable energy is encouraging, but care must be taken to avoid unintended negative consequences on wildlife and existing human uses whether these new developments are on land or at sea. Successful development requires up-front community engagement and careful planning backed by the best scientific and social data, and the means to advance participation by all stakeholders. 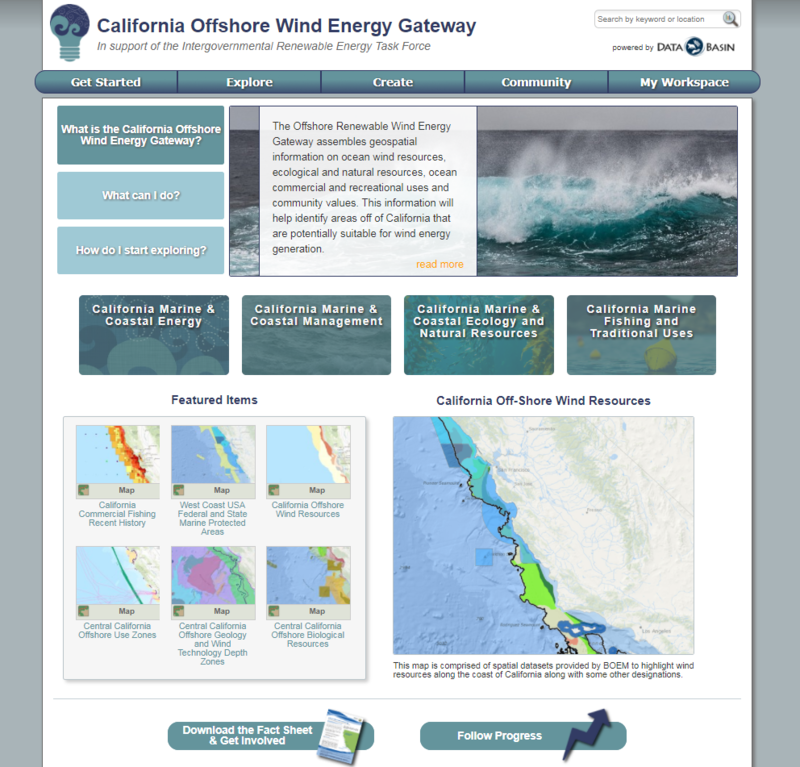 Funded by the California Energy Commission and the US Bureau of Ocean Energy Management, the California Offshore Wind Energy Gateway (https://caoffshorewind.databasin.org/) was launched in early 2017 to support wind energy planning off the California coast. This map-based website was developed by the Conservation Biology Institute (CBI) using their latest Data Basin technology (www.databasin.org). This system is not another typical map viewer. Spatial data remains the primary currency of the system; for example, physical settings data (e.g., wind speeds, marine substrates, and bathymetry), biological survey and species distribution data, marine protected areas, and potential conflicts with fishing, shipping, and other uses. While these data form the foundation of the system, users are the primary focus, demonstrated by many special features such as private individual workspaces, user-defined public or private groups, well-organized content, and commenting tools. Users can easily find over 600 authoritative spatial datasets relevant to offshore wind energy development (from state and federal agencies, academic researchers, and other non-governmental organizations), create their own customized maps using a straightforward mapping interface, share their maps with others, add their own data to the system, and download the content to use in other applications. Participants come from a wide spectrum of technical backgrounds and perspectives – government agency staff, energy developers, fishermen, environmentalists, and interested public. With access to important data and an easy-to-use system that supports collaboration, stakeholders can make informed decisions that promote streamlined renewable energy development while minimizing environmental risk and greatly reducing social conflict. Other Data Basin gateways have been developed to address a wide range of topics and geographies from bat acoustic monitoring (https://batamp.databasin.org/) to climate change adaptation (https://yale.databasin.org/). The California Energy Commission has used Data Basin to address renewable energy siting in the California desert through the Desert Renewable Energy Conservation Plan (DRECP) (https://drecp.databasin.org/) and the San Joaquin Valley Gateway (https://sjvp.databasin.org/), and to help inform the latest transmission planning in the state (https://reti.databasin.org/). Similar Data Basin gateways could be constructed to address renewable energy planning in other parts of the world to identify opportunities while at the same time avoiding unwanted environmental and social risks. CBI is a conservation science-based non-profit founded in 1997 with its main office in Corvallis, Oregon and satellite offices in California, Arizona, Utah, and Montana. CBI’s highly skilled and experience staff combine science and technology to address numerous conservation issues from around the world.